It is necessary to add a Hub in order to control MicroBot Push remotely. This Hub acts as a bridge between your MicroBots and MicroBot Cloud. MicroBot Hub is the companion hub of the MicroBots that connects the MicroBots to MicroBot Cloud. MicroBot Push can be remotely controlled anytime via 3G/4G/WiFi when it is connected to a MicroBot Hub. MicroBot Push will then be activated remotely using your smartphone or tablet. You need a MicroBot Hub and a smartphone or tablet (Android or iOS) with MicroBot Push installed and the device authenticated. Your MicroBot Hub must be placed within the Bluetooth range, about 30-60 ft or 10-18 m from your MicroBot Push. Your MicroBot Hub must always be connected to the WiFi network. If it is offline, the connection with MicroBot Push will be lost and remote control will not be possible. Add a Hub. Power MicroBot Hub and follow the instructions to set it up. See Add a MicroBot Hub. Control your MicroBot remotely. Place MicroBot Hub within the Bluetooth range from your MicroBot, then, in the app, view your MicroBot Push UI and tap the button. When a smartphone or tablet is used as a Hub, the remote control is achieved as follows: your MicroBot Push is connected to one smartphone or tablet (Device B) via Bluetooth that will act as a hub and you activate your MicroBot remotely using another device (Device A) from anywhere via 3G/4G/WiFi. You need two devices, smartphone or tablet (Android or iOS). Make sure that you’ve downloaded MicroBot Push app and authorized both devices using the same email address in order to register both of them in the same MicroBot Cloud. The device that will stay close to MicroBot Push must not be powered off, otherwise, the connection with MicroBot Push will be lost. However, the connection is maintained even if the device is in ‘Locked screen’ mode. Authorize a second device (Soft Hub). Download MicroBot Push app on your new device and authorize it using the same email address as your first device. See Authorize your device. Once the authorization process is completed, verify that all your MicroBots appear in the left side menu of the newly authorized device. Note: Make sure you use the same email address to register all your devices to the same MicroBot Cloud, otherwise, you won't be able to control your MicroBots using all these devices. The number of devices you can authorize per email account depends on your subscription plan. Control your MicroBot remotely. Place your Soft Hub close to your MicroBot (within the Bluetooth range), view your MicroBot Push UI, then tap the button. The UI will be modified depending on which device MicroBot Push is connected to. On the device Push is connected to (e.g. your Soft Hub), the UI will show 'Direct' while on the other device, it will show 'Remote'. In 'Remote', you may have a limited access to MicroBot Push's features. Note: You can use any authorized device (Soft Hub or MicroBot Hub) to act as a hub. However, you must make sure that at least one device is always next to your MicroBot, within the Bluetooth range. 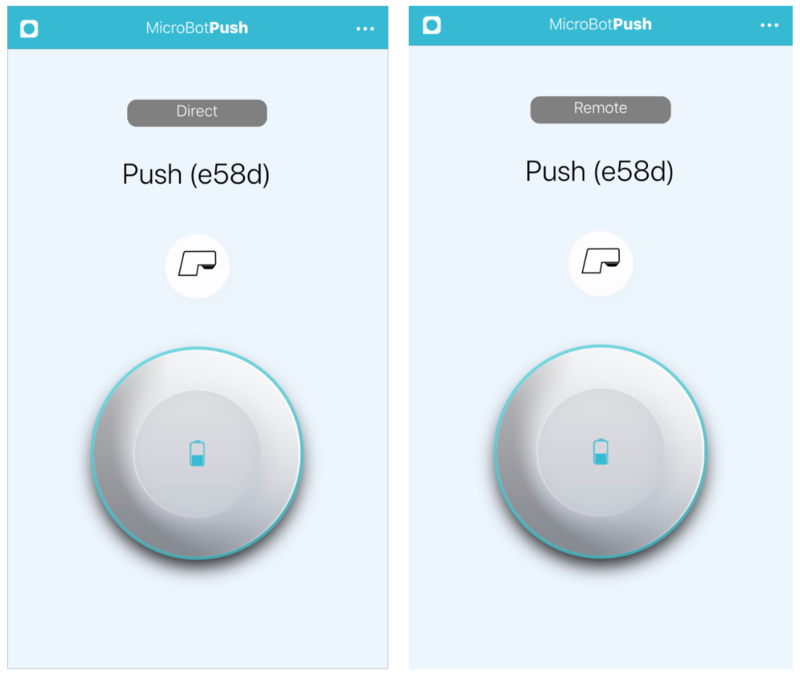 MicroBot Push connects automatically to the device (smartphone, tablet, MicroBot Hub) offering the most stable pairing environment to ensure you can control it from anywhere, anytime.